My Sunday project started out simple enough - infusing vodka with Buddha's hand. But, the process became quite addicting. I was soon rummaging through the kitchen in search of different essences to use. 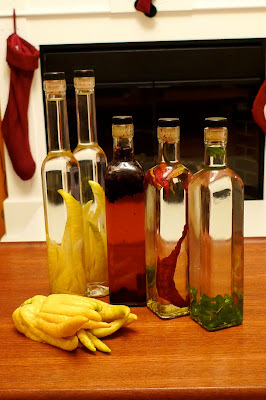 I ended up making two bottles of Buddha's hand, one fresh mint, one with peppers (for Bloody Marys) and a concoction of coffee beans, chicory, star anise and cinnamon. Now, just wait and see how they turn out.